To a Texan, "Six Flags" is more than just the name of an amusement park. As those of us from great state know, the term refers to the six different flags that have flown over our state: those of Spain, France, Mexico, the Republic of Texas, the Confederacy, and—since 1865—the flag of the United States. However, what many folks don’t know is that there was a 7th flag over Texas that has long been overlooked: the flag of the Republic of the Rio Grande. Now, if you’re from the little border town of Laredo, this is no news to you. Laredo has adopted this flag as the city’s official flag. It can be found waving on the streets, hanging on houses, and even prominently displayed in halls of City Council. Red, white, and black with three stars and two stripes, this flag is a symbol for a group of fighting Texians that will not be forgotten. The Republic of the Rio Grande was a small, unrecognized nation. After Texas broke away from Mexico, leaders in other Mexican states were empowered to do the same. 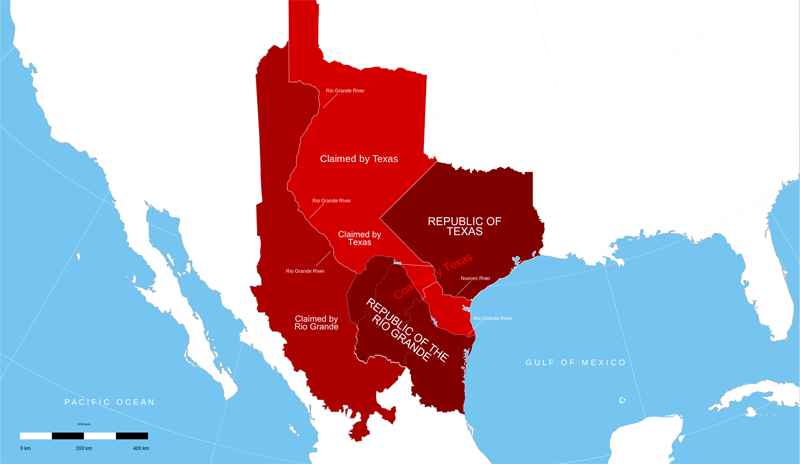 In 1840 the courageous leaders met in Laredo, Texas and declared their independence, claiming the territories of Mexican states, parts of current-day Texas, and even New Mexico for the Republic of the Rio Grande. Those of us who have taken Texas history in school know that Mexico isn’t a country keen on giving up territory without a fight. It’s no surprise that the young Republic soon found itself facing the well-prepared Mexican army on the battlefield. Despite several months of intense battle, the revolutionaries were soon captured. The Republic of the Rio Grande was no more. The Republic of the Rio Grande may have been a small and short-lived nation, but it captures the mind and spirit of generations of Texans. The Republic of the Rio Grande reminds us all to never give up without a fight, especially when fighting for freedom. If you make it out to Laredo, Texas, look up. The flag of the Republic of the Rio Grande will be there, waving in the soft breeze. Look up and remember the brave soldiers that fought for Texas, the stars and stripes of that 7th flag, and remember the Republic of the Rio Grande.